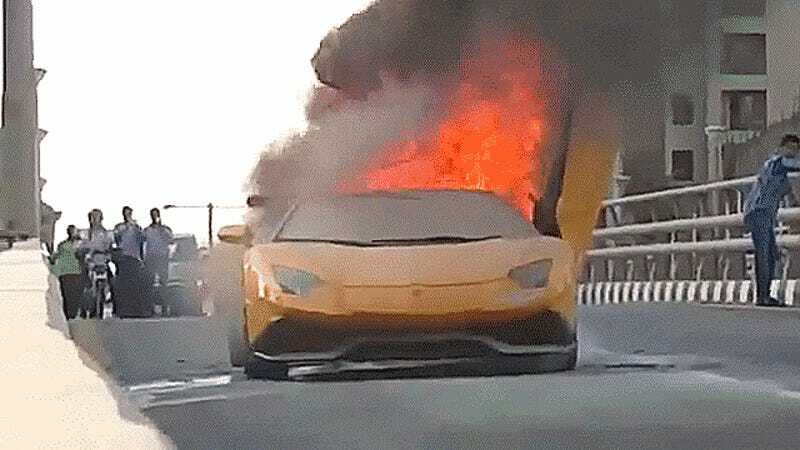 Last month, we caught the first glimpse of what was probably the world’s first Lamborghini Aventador Roadster fire in Dubai from cell phone shots and a faraway video. Now, we have a much better look at how this went down, and it ain’t pretty. Here we see the Aventador SV revving its engine in traffic behind a Ferrari—as one does in Dubai—when the flames spewing from the exhaust catch on the back of the car. The driver must not have known his Lambo was on fire at first, because around 1:55 in the video you can hear people honking at him and screaming “FIRE” even while he keeps revving his engine. Eventually figured it out on the bridge as his sweet ride was consumed in flames. Update: Here’s the Instagram account for the woman who was driving the Aventador at the time (yes, it’s a she, not a he—forgive me for assuming gender!). Also, the car was apparently not an SV but an Aventador Anniversario made to look like one, as well as a rental car.